Dieffenbacher ordered a pushfloor system with vibration screen for crushed bark - production waste wood and a Saxwerk wet ash conveyor Type TKF N for their Energy Plant. If you have questions about this article, please contact Christoph Groffmann, phone: +49 1715292122. 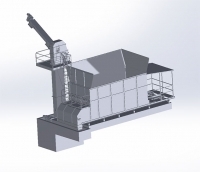 Saxwerk has been ordered to supply fuel bin and associated conveyor line to Cortus's new plant in Höganäs, Sweden. The delivery is scheduled for March 2018. If you have questions about this article, please contact Magnus Landberg, phone: +46 8-500 666 93. November 2nd, the 70 ton heavy hot water boiler is lifted in place at Gällö, Sweden. If you have questions about this article, please contact Tomas Wendt, phone: +46 8-500 666 95.